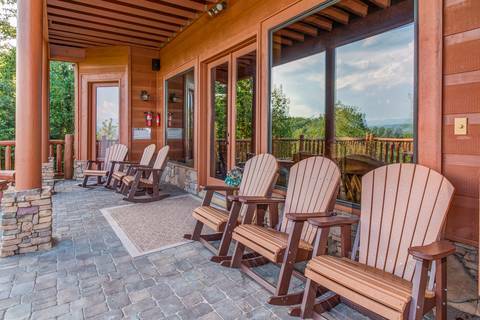 Nearly 4,000 square feet of luxury set among 3 gloriously private acres, Five Bears Mountain View Lodge is the ideal getaway for those who insist on only the best. 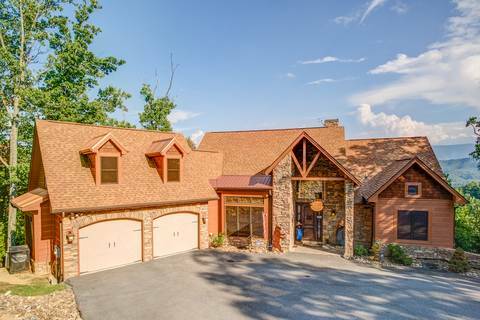 From the moment you drive through the gated entry, flanked by lush trees swaying in the mountain breeze, you’ll know you made the right choice. 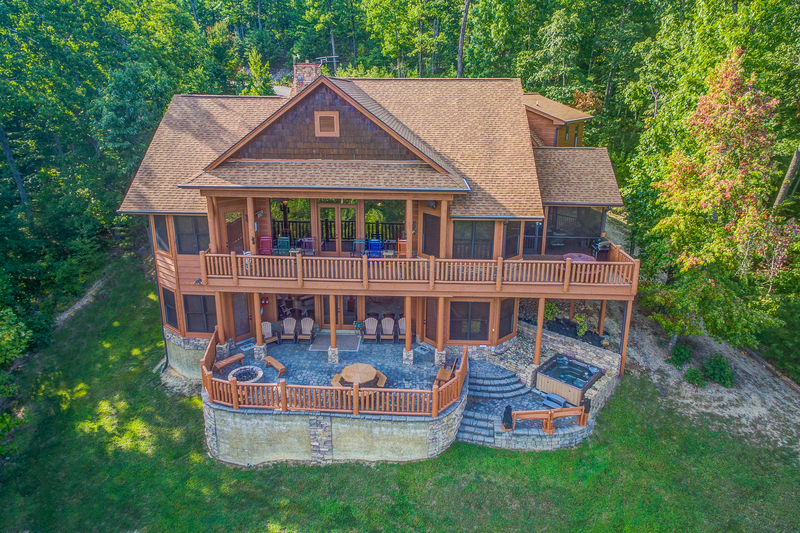 This home sits in The Summit of Walden's Creek Road, a gorgeous community where all of the homes are on the next level with no two homes alike. 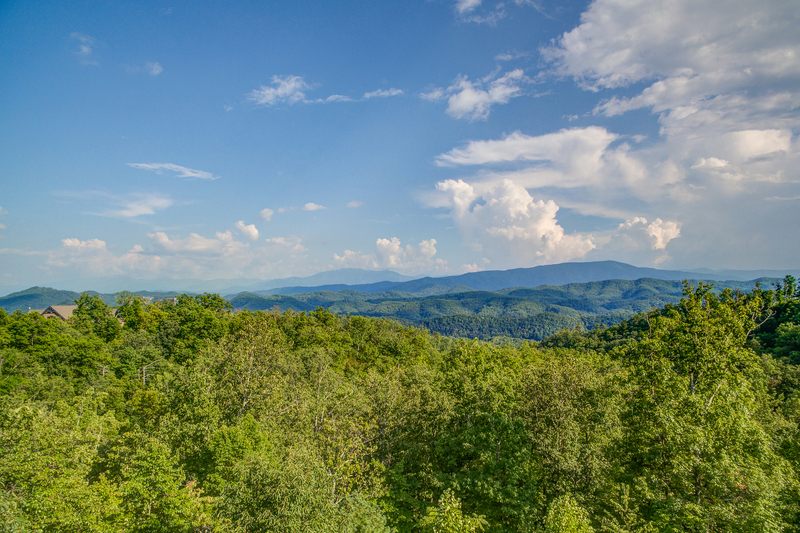 Bring a camera and take a drive on the 30% wider roads, you will not believe the views. 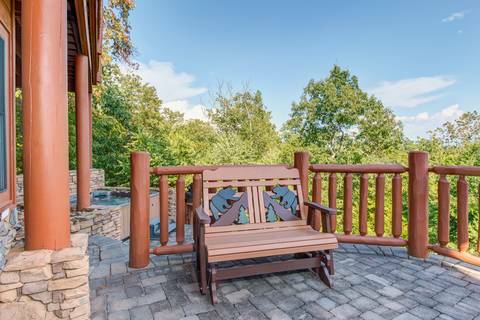 In addition, this home utilizes city water and all of the utilities are ran underground for uninterrupted views. 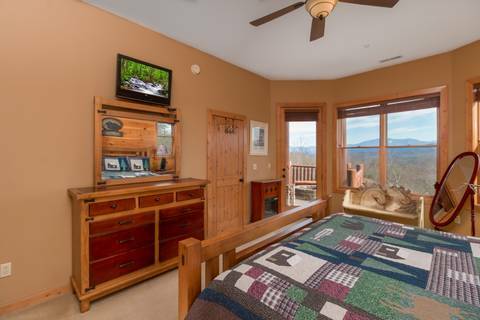 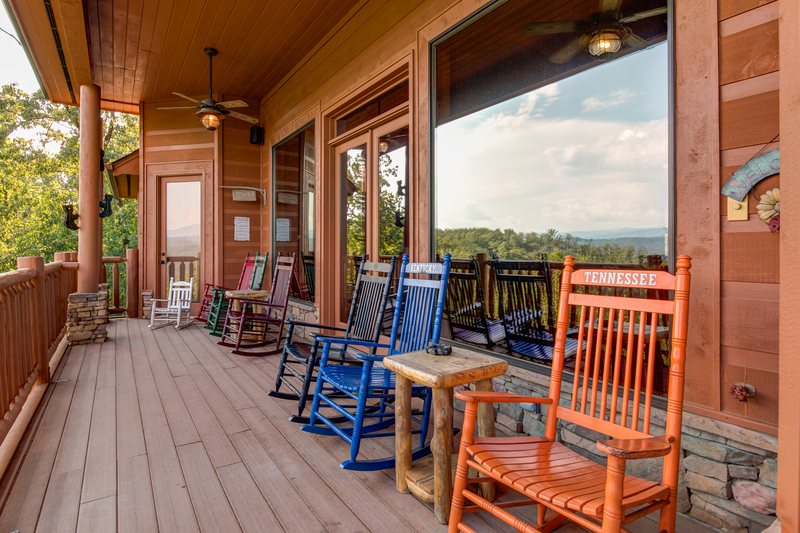 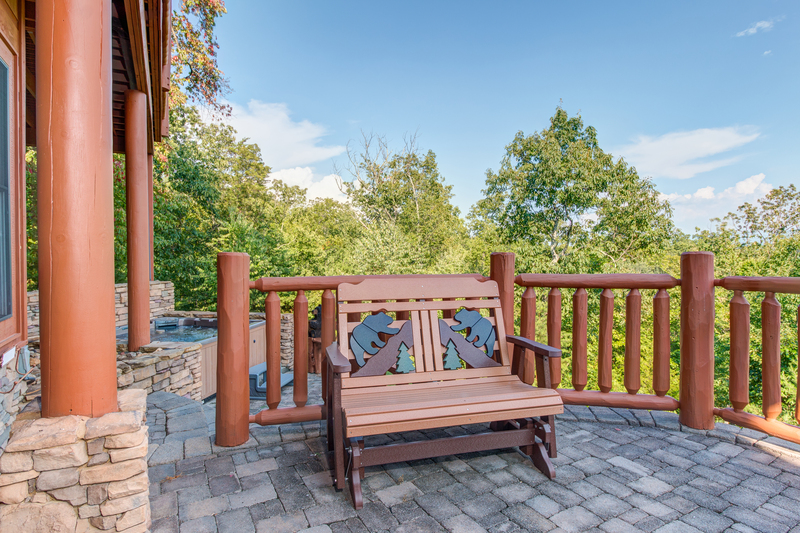 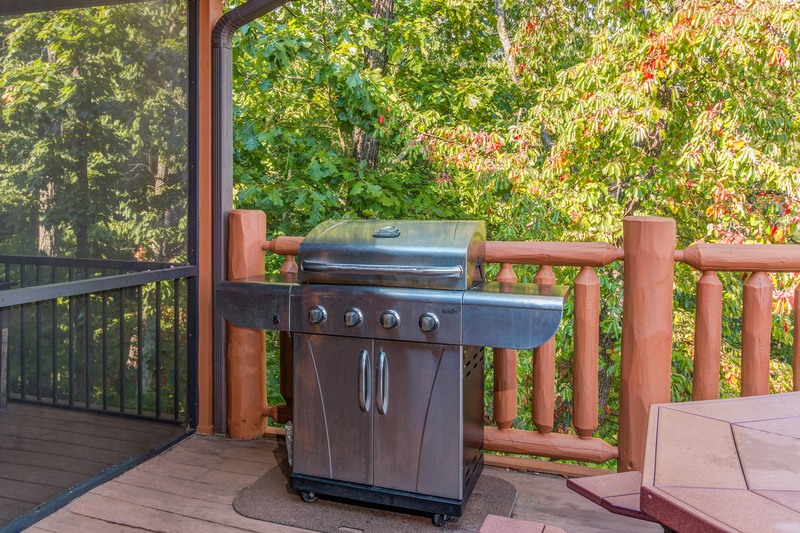 The lower-level patio, the main-level deck, and the screened-in porch, as well as most of the rooms, look out onto the Smoky Mountains. Bring your breakfast out to the porch dining table and watch the mist rise over the mountains; cook dinner on the gas grill and then dine at the deck’s table (yes, Five Bears Mountain View Lodge has 2 outdoor dining areas, as well as an indoor dining table); gather around the porch’s fire pit after sunset to toast marshmallows. 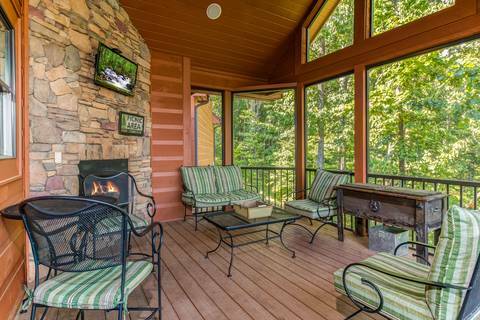 And of course, any time is a good one for kicking back in a deck rocker, lazing in one of the porch’s Adirondack chairs, or luxuriating amid the steamy bubbles of the porch’s hot tub. 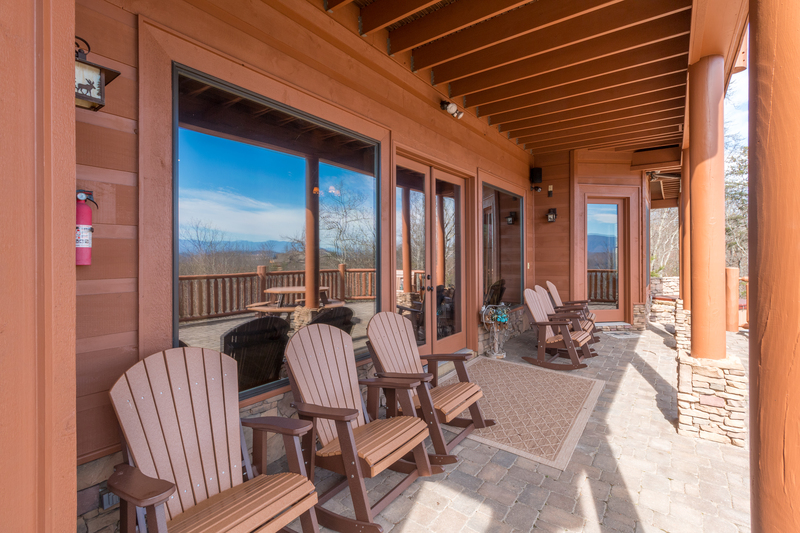 Ceiling fans ensure that the covered deck is a cool place to watch falcons soar over the mountains even during the dog days of summer. 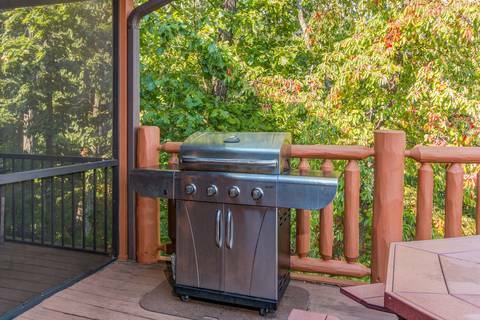 And the screened-in porch enables you to enjoy alfresco living practically year-round: In addition to a ceiling fan, the beautifully furnished space has a stone-surround fireplace (and a TV too). All 5 spacious bedrooms are true suites, with a private bathroom and a wall-mounted TV with a DVD player. 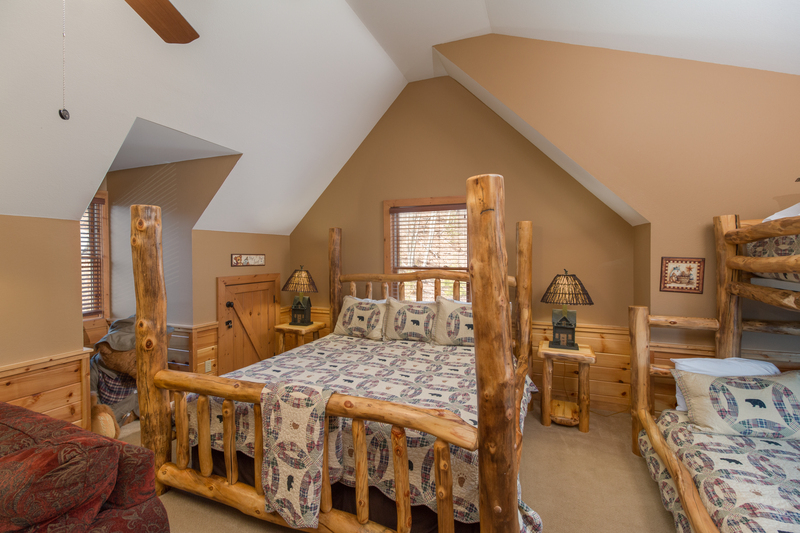 The 2 bedrooms on the lower level each have a king-size bed. 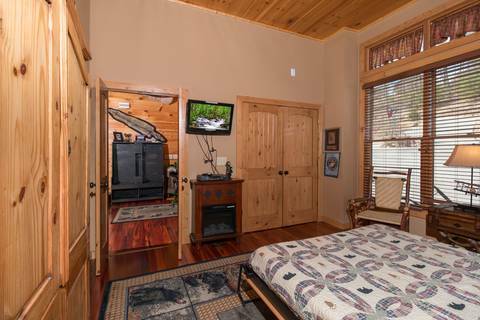 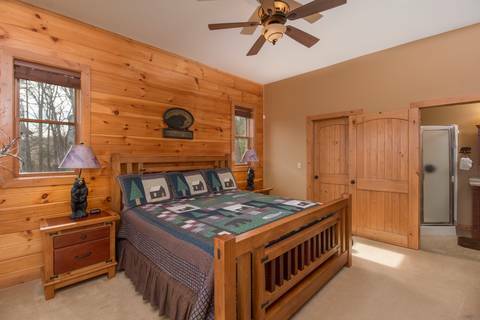 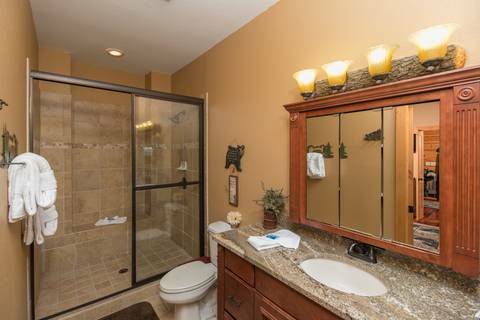 One of the 2 bedrooms on the main floor has a queen; the 2nd, which can be considered the master suite, boasts a king-size bed, a fireplace, and in its bathroom, a large jetted tub. The 5th suite makes up the entire upper level. 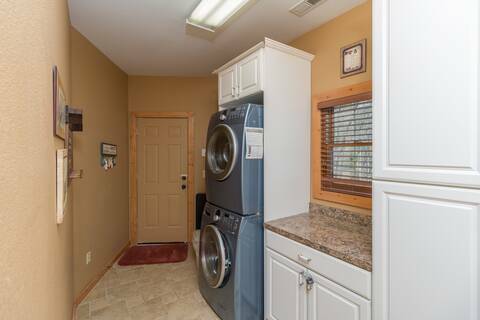 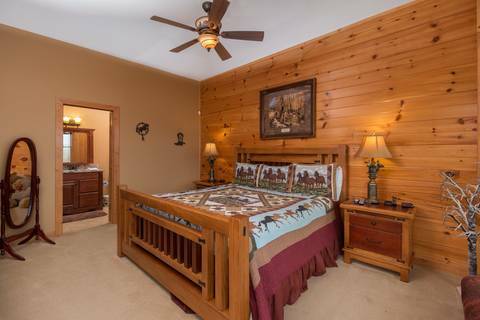 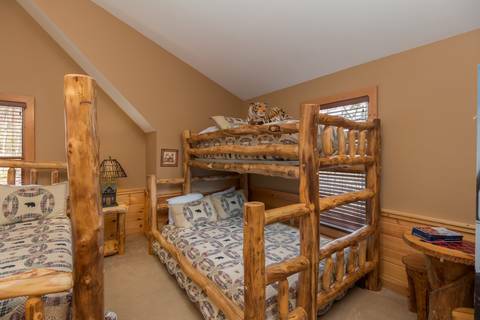 If there’s a family with young children in your group, this room will suit them perfectly: It includes a king-size bed and a twin bunk bed over a full bed, so that as many as 5 people can sleep here. 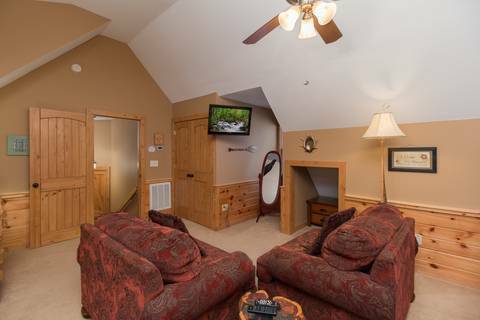 Don’t worry about it feeling crowded; this expansive space includes a sitting area furnished with 2 plush couches. 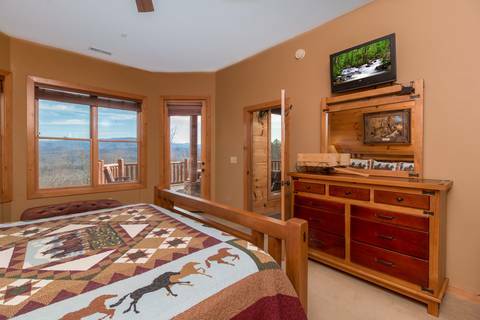 And speaking of couches, one of Five Bears Mountain View Lodge’s myriad sofas converts to a bed for 2, so that the home can sleep 15 people in all. Located on the main floor, the great room is truly worthy of the name. 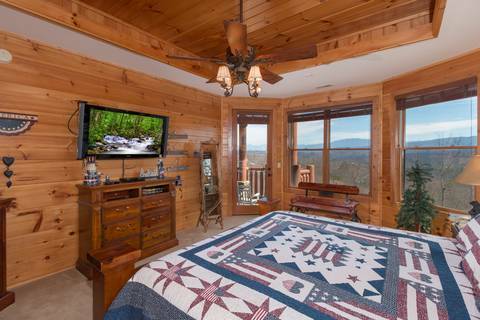 The sumptuous leather couches invite you to stretch out and watch a movie on the flat-screen TV, gather around the stone-surround fireplace for after-dinner drinks, or curl up with a good book or your tablet to surf the web (Five Bears Mountain View Lodge has free WiFi, of course). 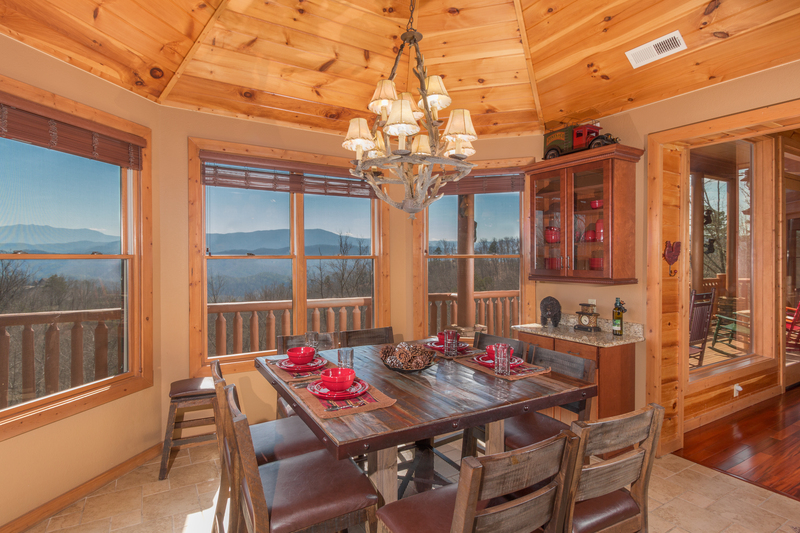 The dining table seats 8, and there are several additional stools so that friends can sit at the breakfast bar. 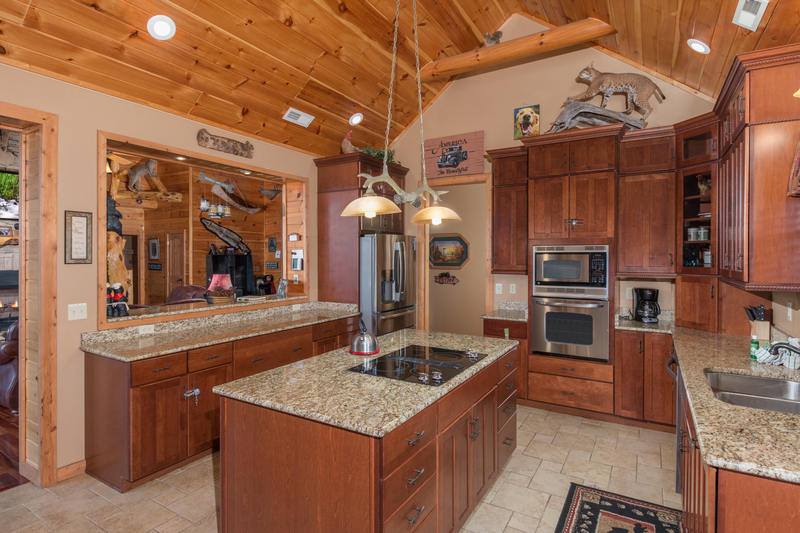 The kitchen is just as outstanding as the rest of the home, with gleaming stainless-steel appliances, cookware, gadgets, tableware, and an abundance of sparkling countertops, storage, and elbow room. 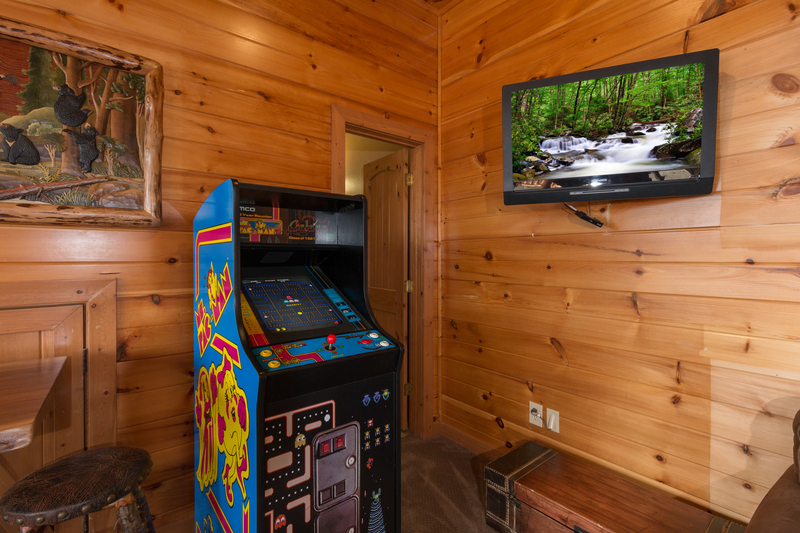 There’s more to enjoy downstairs, in the game room. 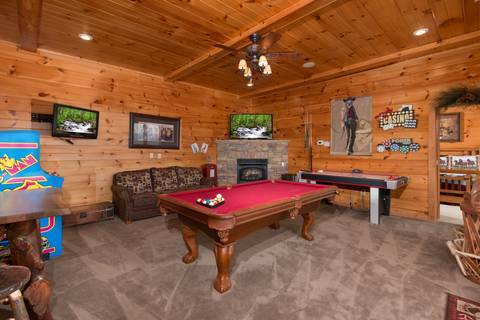 While the centerpiece of the room is the handsome claw-foot pool table, there’s also an air hockey table, a game arcade, a large flat-screen TV, and a Nintendo Wii. 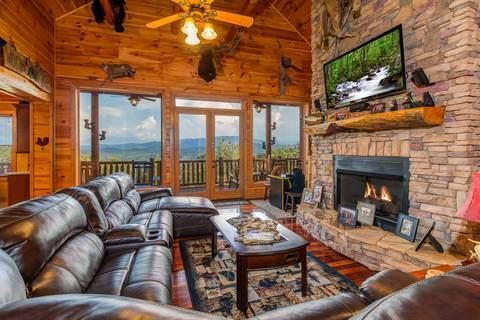 With its fireplace, pub table, and comfortable couch—not to mention its splendid mountain view—this is a great space for unwinding even when you’re not playing games. 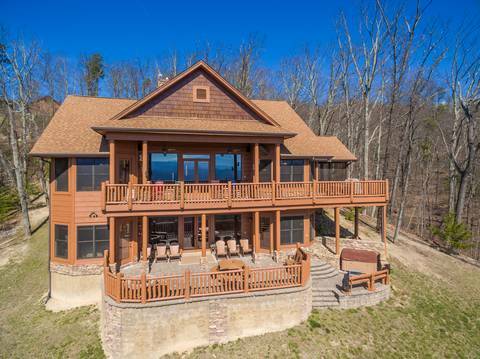 This luxury home cannot accommodate weddings or events larger than 15 people. 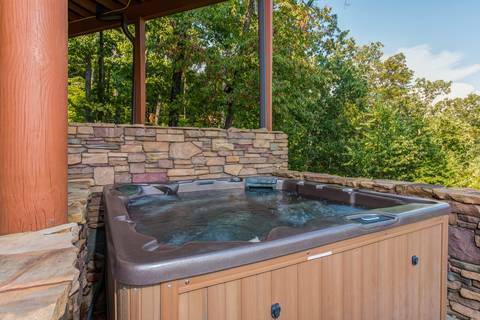 If you are found to be in violation of this fines will be assessed accordingly.